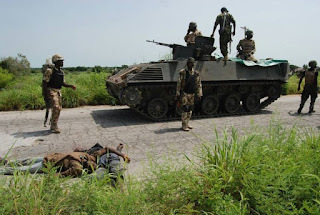 On Sunday, the Boko Haram terrorists ambushed the 222th Battalion troops led by a Brigade Commander, while they were on a cleanup patrol in support of Operation Rainbow along the Bama axis in Maiduguri, State of Borno. The soldiers, however, were able to neutralize the situation after a "serious exchange of gunfire". Weapons and several rounds of ammunition belonging to terrorists were recovered, and troops are still searching for terrorists who escaped with gunshot wounds. The news of the attack, which was available through the Twitter of the Nigerian army, read: "The reports that had just arrived confirmed that the Brigade 21 troops led by the Brigade Commander in a demining patrol in support of Operation Rainbow They were ambushed by BHT along with Maiduguri, Bama's axis around 11 am on September 16, 2018. There was a serious exchange of gunfire. According to reports, the brave troops of 222 battalions were moralized as a result of the recently concluded assurance visit to the theater of operations by Lieutenant General TY Buratai of COAS, who managed to clear the ambush. "As a result, 1 x GPMG and 2 X AK 47 and several rounds of ammunition belonging to the terrorist were recovered." At the time of this report, troops continued to exploit the general areas in search of BHT that escaped with a firearm. wounds. "